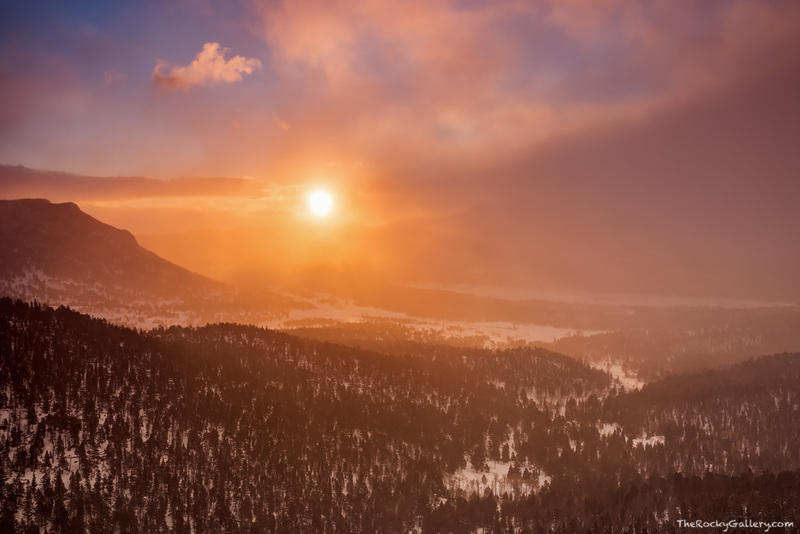 The morning sun crests the horizon over Rocky Mountain National Park and illuminates the sky and snow in vibrant reds and oranges. The winter winds are howling over the high country of Rocky Mountain National Park this morning and snow from the continental divide is blowing eastward into the Estes Valley. Through the blowing snow, the sun shines its warm light along the flanks of Deer Mountain, Upper Beaver Meadows and Moraine Park. Many Parks Curve, located along Trail Ridge Road gives visitors to Rocky a great overview of Moraine Park and Upper Beaver Meadows. Many Parks Curve is also the ending point of Trail Ridge Road over the winter months as the National Park Service only keeps Trail Ridge Road open to this point. Photo © copyright by Thomas Mangan.